Why do I decide to ride in the wind? That's a question I have yet to answer. Despite what I know about how horses react to the wind-- what with tree branches blowing, dust swirling and odd scents wafting through the tumultous air-- I go ahead and tack up, anyway. That's what happened yesterday. My husband and I had planned on heading out to the local river and the adjacent park (scene of my recent ride with my sister and her mare, Cookie), so when the wind picked up I had a decision to make: To ride or go play raquetball at the gym. Or vacuum my house. Not feeling like whacking a ball around a stuffy indoor court nor like being a Domestic Goddess, I opted to ride. It turned out to be... well, not so bad. My husband (who took this photo) had a great ride on Wally, the bald-faced Paint, even though the horse justifiably spooked once when some Mallard ducks erupted out of a clump of cattails. Lexi, on the other hand, was like riding a golden keg of dynamite. It was one of those rides where I never felt in danger of coming off, but was nonetheless grateful that I was wearing my helmet. You know, just in case. Of course, none of this changes anything about how I view going for a ride. 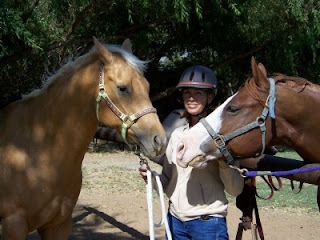 Short of a tornado warning, if I'm in the mood to ride-- and NOT in the mood for raquetball or housework-- I'm tacking up!